Loro Park is open from 8:30am to 6:45pm. Siam Park is open from 10am to 5pm. You can visit the attractions throughout the year on a daily basis. We are comparing Loro Park and Siam Park Twin Ticket with Transfer to Loro Park Prices from leading ticket suppliers and Try to find you Cheap tickets prices on the market. The package that includes visits to Loro and Siam Parks in Tenerife allows its holders to take part in entertaining and educational activities in the two popular amusement parks. Loro Park is a performing and exhibition venue that gives the opportunity to its visitors to witness the majesty and diversity of wildlife species from different parts of the world. The park is home to orcas, dolphins, sloth tigers, flamingos and other exotic species. Siam Park offers many exhilarating rides that will make your hair stand upright. Also, the park boasts various bridges and towers ideal for exploring. Additional benefit of booking the Loro Park and Siam Park package is a convenient transfer from selected hotels to Loro Park. Both amusement parks cater to curious people that crave for entertainment through learning. Loro Park is the attraction that takes you throughout the world as you learn about the wildlife. Siam Park introduces Thailandese culture through entertaining rides and exploring. Both parks are suitable for all ages, but especially for children. Your Experience With Loro Park and Siam Park Twin Ticket with Transfer to Loro Park? Visit two extraordinary amusement parks for a beneficial price. In Loro Park, you will get yourself acquainted with animals from different sides of the world and enjoy outstanding performances of the marine species. In Loro Park, examine diverse birds, mammals and reptiles among other wildlife. In Siam Park, you will enjoy hair-raising rides that are as entertaining as exhilarating. Enjoy the background featuring Siamese (Tailandese) motifs in Siam Park. What Loro Park and Siam Park Twin Ticket with Transfer to Loro Park Includes? This convenient two-attraction package includes a transfer to Loro Park. Pickups and drop-offs are available from hotels located within the specified area. The transfer is available by a coach that is both comfortable and air-conditioned. 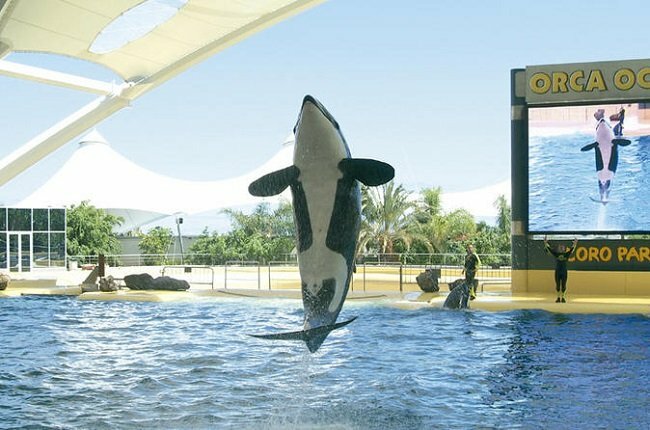 Don't miss the Orca Show in Loro Park, which demonstrates the graciousness and power of these amazing animals. Little kids could take a boat ride "powered" by a dolphin. Note that you will need to leave behind any loose items (sunglasses, for example) before taking a ride in Siam Park. Travelers Reviews about Loro Park and Siam Park Twin Ticket with Transfer to Loro Park? On Viator, visitors to the Loro Park rated this attraction with 5 out of 5. Travelers state that exhibitions and shows are very enjoyable. Available comments imply that a visit to the Loro Park offers great value for money. Both parks are accessible to wheelchairs. However, certain reviews point out that Siam Park, albeit accessible, isn't suitable because of various reasons. To use your ticket, you may present either printed or electronic voucher. The cancellation policy is as follows: full refund for cancellations up to 7 days in advance; partial refund for cancellations between 3 and 6 days in advance. You can choose whether to visit one or both parks included in the price of the ticket. The time frame for using your tickets is 15 days. During that time, you are free to visit each park once or a single park two times. Address of Loro Park is: Av. Loro Parque, s/n, 38400 Puerto de la Cruz, Santa Cruz de Tenerife. Address of Siam Park is: Av. Siam, s/n, 38660 Costa Adeje, Santa Cruz de Tenerife.